Those who lost their homes during Hurricane Sandy are salvaging what they can from the wreckage, and trying to stay afloat financially as they cope with the aftermath of the storm. NBC's Ann Curry reports. Updated at 11:24 p.m. ET: BREEZY POINT, N.Y. -- After waking up to several inches of snow and more than 200,000 new power outages, residents in areas battered by Superstorm Sandy on Thursday got back to the long-term work of rebuilding. 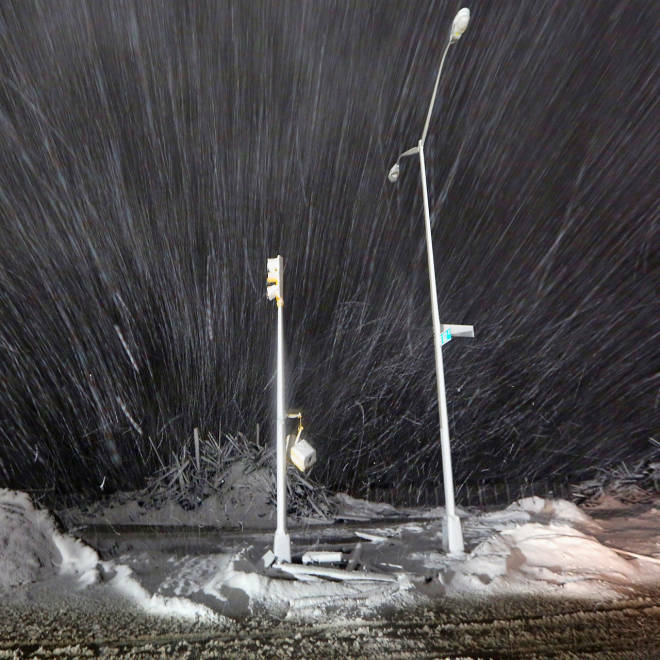 Snow dusted debris outside homes Thursday in Breezy Point, a community in the Rockaways section of New York City. "Patience is the name of the game here," said Joseph Murray in Breezy Point, where snow from the nor’easter dusted the New York City community destroyed last week by flooding and a fire. Families here on Thursday continued efforts to save their waterlogged homes from mold, with some piling items on the layer of snow in 40-degree weather. New York City and Long Island will begin rationing gas to relieve frustration and long lines at the pump, NBCNewYork.com reported. The rationing does not apply to emergency vehicles, taxis or individual gas cans. Murray, 27, was at his family’s home after sanitation workers cleared out their pile of garbage, leaving three salvageable nightstands and a lamp standing outside. "Be patient with Mother Nature because she doesn’t care about any of us," was how Murray rationalized the bizarre bouts of weather. "Let her do her thing and then when she’s ready to let you do your thing, she will." Cleanup crews already overextended from Hurricane Sandy are working around the clock to clear snow that recently fell across the region, causing more people to lose power. NBC's Stephanie Gosk reports. Murray did have an eye on Friday’s weather forecast, noting that "it’s going to be 60 degrees, this is all going to melt." By late Thursday, Connecticut, Massachusetts and Rhode Island had their power fully restored. New York and New Jersey saw a drop in the number of customers affected by the nor'easter. Now about 60,000 customers are without power between the two states because of the storm; more than half a million remain without power total in the two states, including outages caused by Sandy. West Virginia, however, has struggled to bring power customers back online. The overnight nor’easter boasted wind gusts of more than 50 mph and dropped heavy snow on already-weakened tree limbs, leading to new power outages. In New Jersey alone, 167,000 homes and businesses lost power overnight, Gov. Chris Christie said Thursday. "This sets us back about a day" in terms of getting all power restored, he added. "We're right back to the same situation," Kirk Walker of Hackensack, N.J., told NBCNewYork.com after power went out for the third time at his home since Sandy struck. "They said it was gonna be a rough winter," Walker added. "Sign of things to come, I guess." Officials there on Thursday said they had convinced the local utility to scrap its policy requiring that each home without power be inspected before power is restored, Newsday.com reported. With the new outages, some 700,000 customers were without power across the Northeast around midday. That number was reduced to some 600,000 by early evening. Are you left in the lurch after Sandy? New York’s Central Park received 4.4 inches of snow on Wednesday -- a record for a Nov. 7 and the earliest 4-inch total in the park's history, NBCNewYork.com reported. By Thursday morning the total had reached 4.7 inches. Newark, N.J., got 6 inches by Thursday -- more snow in 24 hours than during any previous November on record. Bridgeport, Conn., received 3.5 inches of snow, beating the Nov. 7 record of 2 inches set in 1953. Some areas inland got 12 to 13 inches of snow. "This is a classic nor'easter," NBC meteorologist Al Roker said on TODAY, "just very early." Conditions were still miserable Thursday morning. In New York City, winds were around 25 mph and it was 36 degrees with showers forecast before sunny skies on Friday. In New Jersey, parts of which saw 9 inches of snow, police said ice and snow contributed to the deaths of two people in a car whose driver was speeding, NBCPhiladelphia reported. Two people also died in Connecticut in traffic accidents attributed to snow, The Associated Press reported. Hundreds were evacuated ahead of the nor'easter, some because of flooding fears and others due to post-Sandy logistics. 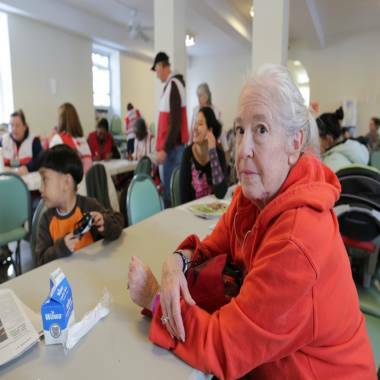 Medeleine Dobriner was moved by the Red Cross to the Manresa Jesuit Center shelter on Staten Island so that her earlier shelter, a school, could reopen. Medeleine Dobriner of New Dorp on Staten Island was among the latter -- having to move because her shelter was in a school that was reopening. "This is my third shelter and usually change is good," Dobriner, 66, told NBC News, "but not in this case." Throughout the region, people wore coats indoors as they endured yet another night without heat. "I thought I was lucky when power was restored last Thursday, but last night it went out again," said Michael Platt, an electrician from Toms River, N.J., who estimated a foot of snow fell in his area. "The kids have been home for nearly two weeks and I'm not working, and when I'm not working I'm not making any money. This hasn't been easy." "Can you believe this? Enough is enough," added Cindy Casey, whose Belle Harbor home one block from the beach in the Rockaways was swamped by Sandy, as she looked out at the snow blanketing the neighborhood devastated by flooding and fire. Some of those who had weathered Sandy told NBCNewYork.com they felt like a cruel joke was being played on them. "Kind of laughing about it at this point," said Danny Arnedos, of Oyster Bay, Long Island. "To go from a hurricane to a nor'easter and driving in the snow in 10 days is pretty unbelievable." "I am waiting for the locusts and pestilence next," New Jersey Gov. Christie said Wednesday. Coastal flooding proved minimal, but commuter bus and train services were disrupted by the storm, with the Long Island Rail Road briefly shutting down all operations to the city's eastern suburbs on Wednesday night. Gasoline remained in short supply in the New York City area, where Mayor Michael Bloomberg on Thursday announced rationing based on odd and even number license plates. Airports saw 1,600 canceled flights on Wednesday due to the storm. Some 600 more flights were scratched Thursday, according to the flight tracking service FlightAware. The majority of those are in the New York area. The losses from Superstorm Sandy are still rough, but New York Gov. Andrew Cuomo said Thursday he had seen a report estimating $50 billion in damage and economic losses across the region, with $33 billion in New York state. "That's a staggering number," he said. NBC's John Makely as well as Reuters and The Associated Press contributed to this report.